Heat a griddle pan on a high heat. Set the steak on a wooden chopping board and drizzle over a little olive oil, then salt and pepper both sides well. Prepare the sauce by roughly chopping 1 of the capsicums into cubes and placing in a saucepan with 1 cup water. Bring to a boil. Cook over medium-high heat 5 minutes until tender, then drain and transfer to a food processor / blender and process until smooth. Stir in 1 tablespoon olive oil and 2 tsp fish sauce. Add the steak to the hot pan, cooking for 3 minutes on each side (or until cooked to your liking). Remove steak from the pan and let it rest for 5 minutes whilst you prep the salad. Slice the second bell pepper into strips and add that, along with the corn and 1 tbsp olive oil back into the same hot pan. Cook for 8-10 minutes until corn is golden, stirring occasionally. Remove from the heat and stir in the avocado. 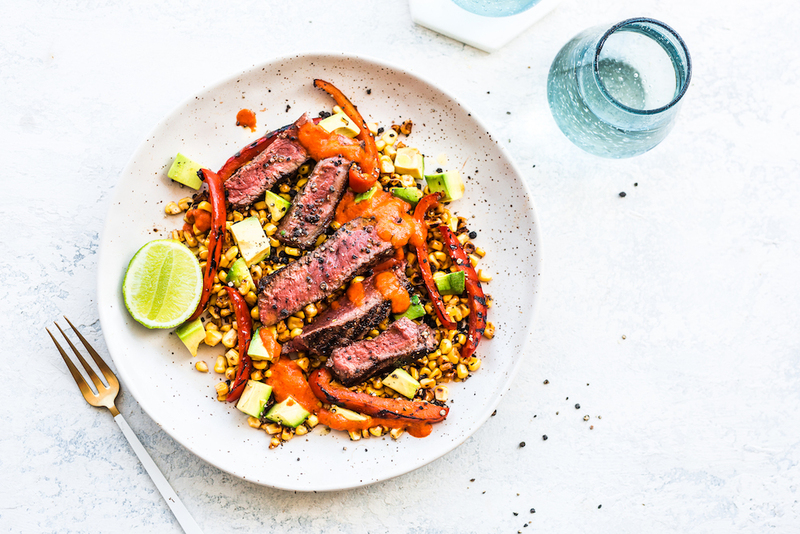 Plate the chargrilled corn, capsicum and avocado. Cut the beef diagonally into slices and place on top. Drizzle over capsicum puree, add a touch more pepper, and a drizzle of olive oil, if desired.